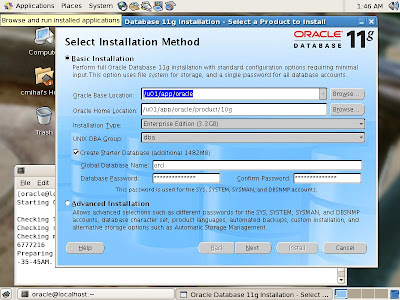 Oracle has made available parts of Oracle 11g, including the database (Oracle Database 11g Release 1 (11.1.0.6.0) for Linux x86) and I figured I might as well give it a spin. Pity there isn't a Solaris version available yet, but I guess this will do. I won't go through the trouble of getting a RHEL 4 or reinstalling Oracle Unbreakable Linux. I'll just use an updated CentOS 5 with all the dependencies installed. After creating the oinstall and dba groups and adding the users (useradd -g oinstall -G dba oracle) it's usually a good idea to do some sysctl tuning unless you have the official Oracle rpm for Unbreakable Linux (see Oracle installation guide for details). The list of security related changes in Oracle 11g is pretty impressive, and, as any security professional can tell you, it's about time! SQL Performance Analyzer, replay abilities, etc. (similar to Quest software: Spotlight, Foglight) and various tuning tools. The connection to Microsoft Access databases (JET) is quite a nice feature. 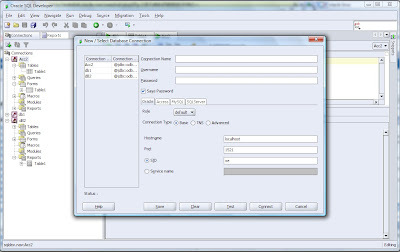 It allows migration without having to connect it to a MS SQL Server first and then connecting SQL Developer to that. It also keeps things in sync between Oracle SQL Developer and the .mdb file. Well, I just came from the official Oracle Database 11g Launch here. They seem to have quite a strong partnership with HP and Intel. Seems like Intel does have a 80 core CPU in development also... neat. I must admit, some of the new features look pretty impressive on paper (Flash Back and Total Recall), and Oracle Secure Files (though it does remind me of ZFS in an odd sort of way). Speaking of which, Oracle Information Lifecycle Mangement (ILM) with policies and all that do remind me of Sun StorEdge QFS and SAM-FS . Interesting how that goes. From what I've seen so far, the update to Oracle 11g seems worth the trouble (though I'd generally give it more time for testing). They will be stepping on quite a few toes, implementing features that are a bit similar to those found in other products... though, knowing Oracle, they could probably just buy them all. After all, they did acquire like 34 companies since 2005 ;-).